Polaroid & Apartheid: Inside the Beginnings of the Boycott, Divestment Movement Against South Africa | Democracy Now! "Have You Heard From Johannesburg?" We look back at how African-American workers at Polaroid in Massachusetts helped launch the divestment movement against apartheid South Africa in the early 1970s. We speak to Caroline Hunter, co-founder of the Polaroid Workers Revolutionary Movement, who stumbled upon evidence that her employer was providing the camera system to the South African state to produce photographs for the infamous passbooks for black residents. Hunter and her late husband, Ken Williams, then launched a boycott of the company. The boycott and divestment campaign ultimately grew to target other corporations in apartheid South Africa, including General Motors and Barclays Bank, among others. By 1977, Polaroid finally withdrew from South Africa. JUAN GONZÁLEZ: In the week since the passing of former South African president and anti-apartheid leader Nelson Mandela, Democracy Now! has looked back at the movement to win his freedom and bring an end to apartheid. Well, today we bring you a key part of the story of how the worldwide campaign to use economic pressure helped bring about the fall of the apartheid regime, even as powerful countries like the United States continued to support it. The story begins in Cambridge, Massachusetts, when two employees of Polaroid discovered their employer’s role in a key part of the oppression of blacks in South Africa. AMY GOODMAN: In a minute, we’ll be joined by one of those workers, Caroline Hunter. But first, this is an excerpt from a film series called Have You Heard from Johannesburg? about this part of the boycott and divestment campaign. We hear first from South African Archbishop Desmond Tutu, then from Caroline Hunter herself, as well as Polaroid vice president at the time, Peter Wensberg. ARCHBISHOP DESMOND TUTU: We are not asking that you make a political decision. We’re not asking you to make an economic decision. We’re asking you to make a moral decision. Those who invest in South Africa are upholding and buttressing one of the most vicious systems the world has ever known. POLAROID AD: Perhaps once or twice in a lifetime, there comes an invention so radically new it actually changes the way we live our lives. Less than two seconds after you touch the red electric button, the camera hands you the picture. It can reveal the world to you as you’ve never seen it before. AWELE MAKEBA: In Cambridge, Massachusetts, Caroline Hunter, a chemist, and Ken Williams, a photographer, were working at Polaroid in 1970 when they noticed something. CAROLINE HUNTER: It was really a fluke. Ken and I were going out to lunch. And as we passed through the workplace on our way out, we saw an ID badge made for South Africa. We looked at it and began to say to each other, we didn’t know Polaroid was in South Africa. UNIDENTIFIED: In South Africa, what Polaroid did was they introduced the kind of technology that would give the government a very effective hold on black people through the pass. AWELE MAKEBA: Blacks had to carry a pass book on them at all times, because they were not considered citizens of South Africa. They were considered citizens of homeland, unfertile grounds where no one could earn a living. To work in the white areas, they lived in labor camps surrounding the cities, all their movements controlled by their pass. The penalty for failing to produce a pass was imprisonment. CAROLINE HUNTER: We really had some sense that no one’s free unless everybody’s free, and that we had some relationship to black people everywhere. And as workers, we had a right to say what happened to our labor, so we started off just asking the question: What is Polaroid doing in South Africa? PETER WENSBERG: This was certainly viewed very quickly as a major issue. It was something that affected our black employees. It affected our white employees, because they had assumed that they were working for a company that was socially responsible. AMY GOODMAN: That was Polaroid vice president at the time, Peter Wensberg. That’s a clip from Have You Heard from Johannesburg?, the eight-part documentary series directed by Connie Field that aired on PBS Independent Lens. Hopefully it will air on PBS again, the whole series. The boycott and divestment campaign ultimately grew to target other corporations in apartheid South Africa, including General Motors, Barclays Bank, among others. JUAN GONZÁLEZ: Well, for more, we go to New Orleans, where we’re joined by Caroline Hunter, the young chemist who was working for the Polaroid Corporation in 1970 when she stumbled upon evidence that her employer was providing the camera system to the South African state to produce photographs for the infamous pass books. Along with her partner, Ken Williams, she formed the Polaroid Workers Revolutionary Movement to campaign for a boycott. By 1977, Polaroid finally withdrew from South Africa. Caroline Hunter, welcome to Democracy Now! JUAN GONZÁLEZ: Well, your thoughts, first about that movement back then, the reaction of Polaroid to your questions and your concerns, and especially now in this week after the death of Nelson Mandela? CAROLINE HUNTER: Well, Polaroid pretended they didn’t know what was going on in South Africa. But Polaroid was founded in 1937. In 1938, they opened their first distributorship in South Africa. Reflecting on the death of Mandela, I think we have lost one of the greatest human beings who has ever lived. And we must learn from his example that one person can truly make a difference in the life of not only his people, but in the life of the world. AMY GOODMAN: Well, Caroline Hunter, you certainly proved that a person can make a difference. Describe the moment when you started to make the connection. I mean, this is the early '70s. You're a chemist, a young woman chemist working at Polaroid in Cambridge, Massachusetts, when you realize the connection between apartheid South Africa and your workplace, your work. CAROLINE HUNTER: Well, it’s interesting that I’m in New Orleans when I’m doing this interview, because I learned about apartheid in 10th grade at Xavier University Preparatory High School, where I graduated in ’64. And our social studies teacher, Mr. Valder, introduced us to Cry, the Beloved Country. And the book resonated with me; the suffering and the pain induced by apartheid moved me at that time as a 10th-grader. I saw apartheid again with the Sharpeville massacre, and then it was out of my mind until that moment at Polaroid. And all I knew then was it was a bad—South Africa was a bad place for black people. We had to educate ourselves. We studied Verwoerd and Malan, the creators and the architects of apartheid, the legislation and the history, traced it back to Nazi Germany, and the fact that population registration and control was a tool. And Polaroid had the technology that made that tool effective and brutal. JUAN GONZÁLEZ: And then, of course, around the same time, a huge campaign developed against the South African Krugerrand, the gold coins, because the African—the South African miners were terribly exploited within the mines by the government, and that was at the period when gold was rising in value. The camera was also used to photograph the miners. We saw one of the examples of the—of a miner’s card, as well. AMY GOODMAN: This is another excerpt from Have You Heard from Johannesburg? that looks at how Polaroid responded to the boycott. We hear first from Polaroid Vice President Peter Wensberg, then Bill McCune, Polaroid’s executive vice president, other employees, and then Edwin Land, the company’s president during the campaign. PETER WENSBERG: We decided to form a committee to try to decide what was the right thing to do. PETER WENSBERG: And it suddenly seemed like exactly the right thing to do. AWELE MAKEBA: Polaroid sent a team of employees to Johannesburg to ask South Africans whether the company should withdraw. But in South Africa, people couldn’t speak freely. Calling for the withdrawal of foreign investments was a crime punishable by death. POLAROID EMPLOYEE 1: The basic concern was that we could do nothing about the system, even withdrawing Polaroid film. POLAROID EMPLOYEE 2: The only thing that they felt that you could do is to do something that would help them educationally and economically. AWELE MAKEBA: The company concluded that they would remain in South Africa and launch a program to improve conditions for their workers. PETER WENSBERG: The Polaroid experiment was establishing an educational foundation, establishing training classes, realign the wage scales. Also, we said that our distributor, Frank & Hirsch, were going to stop selling products to the government. AWELE MAKEBA: And Polaroid became the first company doing business in South Africa to publicly denounce apartheid. EDWIN LAND: We’ve been able to take what is really a tiny activity and convert it into a presence for doing a great deal of good. AMY GOODMAN: That’s a clip from the eight-part documentary, Have You Heard from Johannesburg? The last person, Edwin Land, the president of Polaroid, Caroline Hunter, you confronted him. CAROLINE HUNTER: Yes, we did. We presented the demands to some of his first vice presidents. And then, in February of 1971, the day before we testified at the United Nations Special Committee on Apartheid, Ken and myself and the workers attended a conference of the International Chemists and Physicists at which Land was the main speaker. We had a teach-in with Science of the People, and we got on the stage before he spoke, with signs and banners, and talked about the brutal oppression in South Africa that Polaroid had been profiting for, for many, many years. The study committee was just a way to continue doing business in South Africa. And South Africa made it very clear that under no circumstances would a white ever supervise a black in South Africa, and no matter how much Polaroid raised their wages, the system of apartheid would continue. JUAN GONZÁLEZ: Now, the Polaroid executives in that film show that they were attempting, or at least say that they were attempting, to get to the bottom of the issue and respond to it, but you ended up being suspended by Polaroid, didn’t you? CAROLINE HUNTER: Yes, I was suspended and eventually fired for misconduct detrimental to the best interest of a corporation, calling an international boycott. The study committee was just, again, another corporate delay strategy, another strategy to cover up the fact that in a police state, which is what South Africa was, you could not speak against apartheid. You could not even say the name Nelson Mandela. You couldn’t say Polaroid shouldn’t take these pictures. So, to go and interview people who were imprisoned by your system was just disingenuous. AMY GOODMAN: I want to go back to a clip from the film about a black resident of Johannesburg describing his pass book. INTERVIEWER: Do you have your pass on you? You’re the mayor of the place. What does it say your status here is? JOHANNESBURG RESIDENT: Well, in this reference book here, it is stated that I am permitted to remain in the area of Johannesburg as a casual laborer. JOHANNESBURG RESIDENT: I can be thrown out, any day, as long as anything goes slightly wrong with this reference book. AMY GOODMAN: The use of that pass book, Caroline, and where you ended up—here, you’re fired from Polaroid—and how the movement ended up with the corporate campaign, not only against Polaroid, but other corporations that were invested in South Africa? CAROLINE HUNTER: Yes, actually, firing me gave me more time to devote myself to the campaign to get Polaroid out of South Africa. As one of our leaflets said, our—for Polaroid and the 650 corporations doing business in South Africa, “Apartheid is our business, and business is good.” South Africa was mineral-rich and had the most cheap labor pool at that time. And so, many, many U.S. corporations profited, kept their dealings secret and continued to be in South Africa until the pressure in the United States grew, the international pressure grew. We got the City Council in Cambridge and the City Council in Boston to begin the sanctions movement. 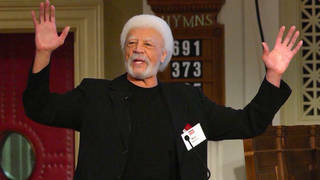 And eventually, Congressman Ron Dellums—our group visited Ron Dellums in the Black Caucus—he began to file the national legislation which after 15 years was enacted, over presidential veto. AMY GOODMAN: And you met with Nelson Mandela when he came to the United States? CAROLINE HUNTER: Yes. That was the thrill of a lifetime. We had received information from the ANC throughout our campaign that they were aware of our activities and encouraged us to continue. But in 1990, myself and my late husband went to a reception in the evening with Nelson Mandela. And if you—we had the pleasure of meeting him, receiving his thanks, his acknowledgment that our efforts made a difference in South Africa. JUAN GONZÁLEZ: And these days, what are you doing? Are you continuing social justice work? CAROLINE HUNTER: Well, I’m actually a retired public school educator. I retired from 34 years of public teaching in administration in Cambridge, Massachusetts. In 2001, I received the National Education Association’s Rosa Parks Memorial Award, which was quite an honor to be associated with her, for my anti-apartheid work. AMY GOODMAN: Well, Caroline Hunter, I want to thank you so much for your work and for sharing your story. Caroline Hunter, a young chemist working at Polaroid when she stumbled on evidence that Polaroid and her work was being used to provide the camera system to the South African state to produce photographs for the infamous pass books. Along with her partner Ken Williams, she formed Polaroid Workers Revolutionary Movement to campaign for a boycott. By 1977, Polaroid finally withdrew from South Africa. And, Caroline, I want to thank you for inspiring so many students, as well, in the United States. I was among them, where—when we would do our work at our university, attempting to get our university to pull out of South Africa. Your work and Ken’s and so many of the workers’ were the inspiration for that work. This is Democracy Now!, democracynow.org, The War and Peace Report. We’ll be back in a moment with Andrew Cockburn, who was the original reporter on the story that Nelson Mandela was targeted by the CIA, was fingered by the CIA, intelligence given over to the South African regime for his capture. Stay with us.